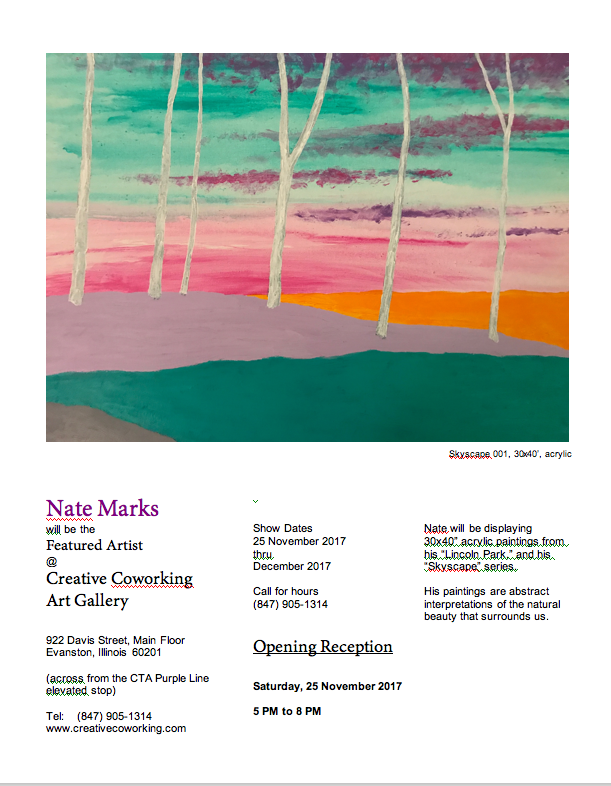 Nate will be a featured artist at the Creative Coworking Art Gallery. Opening reception Saturday, 25 Nov., 5-8pm. 922 Davis St., Evanston. The show will run thru Dec.
Click here to see some of the products this design is design is applied to. Gifts designed for home, office, and (of course) you! Now is the time to select from over 100 exciting new decorator designs at Nate Marks art – from greeting cards, framed prints, pillows, phone and computer covers, to coffee mugs, hoodies, rugs, duvets, jewelry, and more. Fine art and designer gifts by Nate Marks. See them all at: http://www.natemarks.com/store. Follow us on Twitter @designmarks1.